The Triumph Street Twin was the motorcycle that changed my perception about retro-classic motorcycles. Prior to riding it I always assumed retro-classics to be boring, but the Street Twin wasn't just cool, it was also a lot of fun to ride with its peppy engine and confident handling. 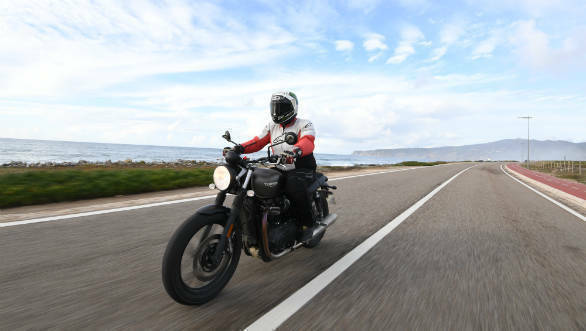 In fact the Street Twin is the best-selling Bonneville already and has helped Triumph attract younger buyers since its launch three years ago. For 2019 the bike gets a comprehensive midlife update, which Triumph hopes will help in making Street Twin even more popular. 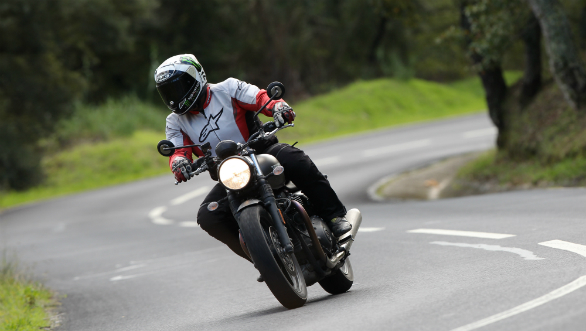 Here's our first ride report, straight from Portugal. 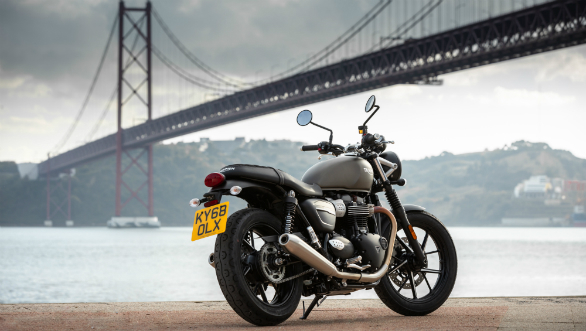 The Triumph Street Twin is the newest member of the British manufacturer's iconic Bonneville family for retro-classic motorcycles. Positioned as an entry-level Bonneville, the Street Twin feels anything but that with its youthful design, excellent build quality and able manners. It is powered by a 900cc, liquid-cooled parallel-twin engine that's mated to a five-speed gearbox. When launched originally, its strong bottom end lunch was a distinct highlight of the Street Twin's powertrain. For 2019, the engine has gotten more powerful, along with a raft of other updates. The engine offers 65PS of power now, up from 55PS earlier and also revs higher, with the redline now set at 7,500rpm as opposed to 7,000rpm earlier. Peak torque remains the same at 80Nm and is available from just 3,800rpm, but the torque curve has been improved and there more torque available across the rev range now. The engine has also received new parts including magnesium cam covers and a lighter crank along with dead and balance shafts, that help it spin quicker while feeling even smoother and more refined than before. The clutch has been lightened for better actuation and to reduce effort at the lever, and it also offers a slip function now. In addition to traction control which was on offer right from the start, the Street Twin now also comes equipped with two riding modes - Road and Rain - which is a first for its segment. Switching modes alters the throttle maps and traction control settings, apart from which you can switch traction control off too, though ABS cannot be turned off. All these controls can be accessed via a single switch on the handlebar as Triumph didn't want to complicate controls by adding more switches, the idea being to keep the Street Twin as simple a motorcycle as possible. Suspension has been updated as well - the Street Twin now runs on 41mm KYB cartridge forks now which claim better stability and improved handling. 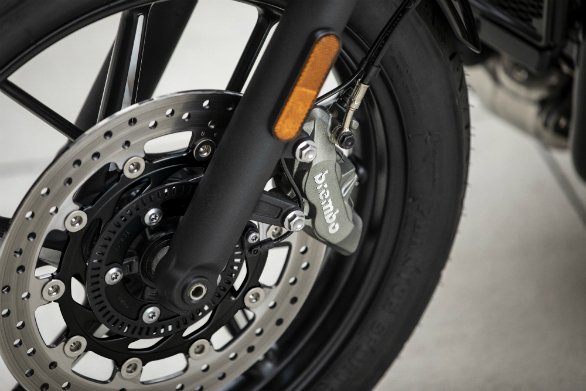 The updated braking system for 2019 includes a four-piston Brembo caliper with Brembo branding. 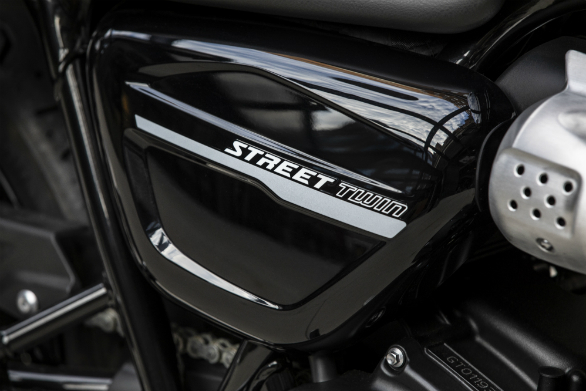 Triumph has also increased the seat height of the Street Twin by 10mm, by adding an additional 10mm of padding to improve comfort and seat height now stands at 760mm. The rider triangle has thus improved, making for a more comfortable seating position than before. Styling remains unchanged but the Street Twin has ditched the stripes on its fuel tank and only has the Triumph logo on the tank. The Street Twin logo has been revised too and is writ across the side panels in a new font, and looks even more appealing now. The stronger engine performance allows the Street Twin to puller harder now in each gear to start with. 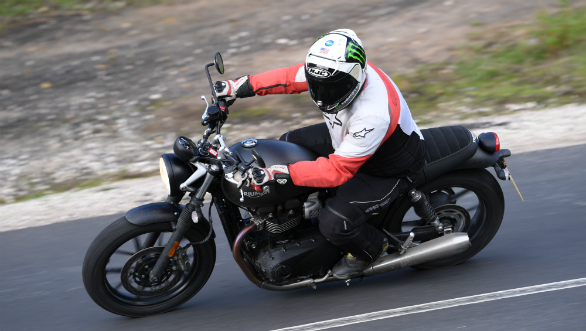 Highway performance has improved as well and the improved midrange and top end performance should help in making the Street Twin even better suited to long rides. At a speedometer indicated 100kmph the engine is spinning at just 3,150rpm in fifth gear and feels calm and relaxed. Drop a gear and open the throttle and the bike is quick to accelerate and builds speeds in a jiffy even when doing triple digit speeds, as I found out on the open stretches of the highways in Portugal. In fact, Triumph claims that 3,500rpm to 5,500rpm is where most motorcycles are ridden in urban conditions and that is the rev range they've focused on beefing up and improving performance, to ensure the Street Twin boasts excellent rideability in the real world. The clutch lever feels extremely light, as if belonging to a smaller capacity motorcycle and not a 900cc retro-classic. 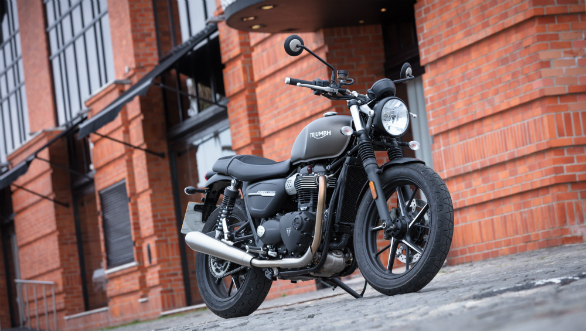 The riding position feels sportier and more compact than its sibling, the Street Scrambler, which we also got a chance to ride alongside, as the Street Twin's handlebar is shorter and narrower thus needing you to lean forward slightly to reach it. This makes for a sportier feel around corners though taller riders might find the handlebar a little too compact. The Street Twin's seat sports dual textures now  while the sides continue to look like conventional leather, the top of the seat gets a suede-like finish that looks more rugged and premium and also offers better grip. This helped me avoid sliding forward when braking hard or shifting my weight around corners. On the handling front, stability around corners has improved thanks to the updated suspension, which also offers a more confident feel at all times. This is something I appreciated particularly when flicking the bike from one side to another around the innumerable switchbacks on the roads of Portugal, as the transitioning was extremely quick and confident too. With a four piston caliper gripping the 310mm single disc upfront now braking has improved as the Street Twin feels surer and more confident even when braking hard. The roads we rode on in Portugal were wet and cold but I had no trouble braking hard as the bike felt confident and ABS was not too intrusive. Grip from the Pirelli Sport Comp tyres, which were developed with Pirelli originally in 2016 is excellent at all times and do their bit in making the Street Twin an able handler. As I mentioned at the start, the Street Twin was a revelation of sorts for me when I rode it first, and the bike feels even more impressive now. The improved engine performance, better handling courtesy the improved suspension, more comfortable seating and better brakes all help it offer a sportier feel than before. 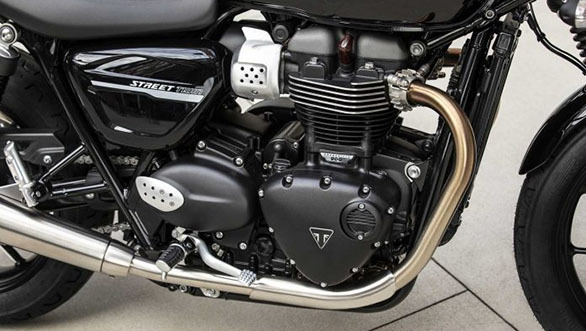 Build quality is top-notch while fit-finish levels are excellent too and on the whole the Triumph Street Twin does feel like a well-built motorcycle. When launched sometime next year we expect to be priced in the same region as the current bike, which retails at Rs 7.83 lakh ex-showroom pan India. The Bonneville range of retro-classics from Triumph have always been extremely likeable and have a huge fan following the world over and thanks to the updates, the 2019 Street Twin is sure to appeal to a wide spectrum of buyers.